"[We need] as leaders to offer life and hope to our people where there seem to be only despair and desperation." Kiribati's islands may be submerged by the sea and disappear because of rising sea levels caused by global warming. This is indeed a grave plea to the international community. The world may sustain limitless damage from extreme weather and catastrophic floods if climate change were to be left unchecked. Preventing climate change is the responsibility of the current generation. Today, I should like to share with the public Japan's responsibility and resolve concerning this subject. The world has begun discussions on the creation of a new framework whose purpose is to prevent climate change. A major point of debate in this context is the reduction target of greenhouse gases (GHGs) for 2020, the so-called "mid-term target". I should like to explain my ideas and decision on this mid-term target. Reducing GHGs will have a substantial effect all throughout the daily lives of the public, such as on household finances and employment. Therefore, before taking my decision on Japan's mid-term target, I had experts analyse these effects in a comprehensive and scientific manner, including economic impacts. The results were the six options you see here, which were presented to the public and on which views were thoroughly sought. Over ten thousand views were received through the public comments process, a very large number. We also conducted public opinion surveys and meetings for exchanges of views all around the country. I thank the many people who have given serious thought to this matter. There are three basic principles I should like to present. The first principle is on the participation of all major emitters, that is countries which emit GHGs on a major scale, and on Japanese leadership. GHGs need to be reduced in the entire world in order to overcome the challenge of climate change. As indicated here, under the Kyoto Protocol, reduction commitments have been made by countries which emit only three tenths of the world's total emissions. This is as indicated in this pie chart. It is obvious that the forthcoming framework needs to include all major emitters including the United States and China, each of which emits 20 percent of global emissions. To achieve this, Japan needs to show leadership that sets the trend for the world. At the same time, international equity, or fairness, is also very important. If stringent obligations are imposed on Japan alone, Japanese companies and factories will move to other countries with lighter commitments. This would merely mean that money and jobs move overseas and total global GHGs will not decrease. The second principle is ensuring that the environment and the economy are compatible. We must not relax our measures to tackle climate change even in the midst of this once-in-a-century economic crisis. In order for our countermeasures against climate change to be enduring, it is critical that they should be made compatible with the economy. The mid-term target cannot stop at being a mere declaration; it must be something both well-backed and feasible. The third principle is to ensure that we achieve our long-term goal. The world's total GHGs need to be halved in order to stabilise the earth's temperature. This is as agreed at the G8 Hokkaido Toyako Summit last year. In order to achieve this long-term objective by 2050, I believe emissions need to peak by 2015 in developed countries and by 2025 in developing countries. Japan has decided to make a 60 to 80 percent reduction of GHGs by 2050 its long-term target. The mid-term target I decided this time must serve as a milepost on the way to achieving this long-term target. I shall now turn to my decision on the mid-term target. Over seventy percent of views expressed through the public comment procedure supported an emissions reduction of 4 percent compared with the 2005 level. They supported the first of the six options. This is the reduction level which would be achieved by taking measures whose costs are comparable to those to be taken in Europe and the US. There were many voices of support for this option from the business community and labour organisations. Obviously, these views must be taken seriously. But in order to lead the world in the low-carbon revolution, should we not have the resolve to step ahead and to make twice the effort? This is what I believe. And it is why I deliberately chose the target of a 15 percent reduction from the 2005 level. Meeting this target would involve a greater reduction of emissions than the "14 percent reduction" option by boldly taking in contributions in the area of solar power generation and elsewhere. It is an extremely ambitious target which would aim to achieve a 33 percent improvement in energy efficiency. This level of improvement would even exceed the 30 percent rise in efficiency at the time of the oil crises (in the 1970's). On the other hand, if we were to choose an even greater reduction target, we would be in a situation for example where we could only allow the construction of houses with solar panels, or where we would have to continue giving out massive amounts of subsidies. Moreover, the public burden would be excessive. I, in a position of responsibility, cannot ask the public to accept such an option. The Japanese target I decided goes beyond the mid-term targets of Europe, which stands at a thirteen percent reduction from the 2005 level, and that of the Obama administration of the US, which is a 14% reduction from the same year, as you can see in this chart. Furthermore, the mid-term targets of Europe and the US will be achieved through a combination of reductions in the countries or regions themselves, emissions credits purchased from other countries, among other means. In contrast, Japan's target which I decided this time is calculated on the basis of energy-saving and energy-conservation efforts to be taken in Japan as well as of other domestic efforts. The target is of "clear water" efforts (literally mamizu, meaning net efforts), so to speak. Additional reductions by Japan, such as those through emissions credit purchases and reforestation, were estimated to reach 5.4% under the Kyoto Protocol. I will decide on such additional reductions under the forthcoming (post-2012) framework after discerning the course of future international negotiations. This is the obvious thing to do in the course of negotiations. Today's announcement on the mid-term target is an expression of Japan's approach to this issue. It is, so to speak, a first step towards fully-fledged international negotiations. The actual rules will be decided from now in these international negotiations. We will take part in them assiduously and ensure that Japan alone will not be placed at an unfair disadvantage. The response by developing countries is also a major point of debate. Ensuring compatibility between growth and the environment represents a serious challenge for developing countries, which seek to achieve high rates of growth. Short cuts should be found if they utilise the experience and accumulated knowledge of developed countries which have gone through many years of trial and error. Developing countries should take their own action, and not merely attribute the matter to the "responsibility of the developed countries". Japan wishes to contribute to global emissions reductions through the use of the energy-saving/ energy conserving and environmental technologies it has developed thus far. Japan shall not refrain from providing technical assistance to those developing countries which take part in the new (post-2012) framework in a manner which shares the burden of responsibility. Some may argue that the mid-term target announced today is insufficient to meet the scientific imperative. It would be extremely difficult, however, to move along a linear path towards to "a 60-80% reduction by 2050" by merely utilising existing technology. The development and widespread use of innovative technologies yet to be seen is required. We will make utmost efforts to develop and promote widespread use of innovative technologies and nuclear power. Analyses show that combining such efforts with the attainment of the mid-term target will lead to a reduction in GHGs by about a quarter by 2030 and approximately 70 percent by 2050. Thus this mid-term target will pave the way to attaining Japan's long-term target. Frankly speaking, this mid-term target certainly cannot be reached easily. Japan's energy efficiency is already twice that of Europe and the US. It is the highest in the world. Yet I do not subscribe to the view that "there is no further room to increase energy efficiency because Japan is already ahead in this area". I recently visited a glass factory in a certain town. This small factory developed technology to remove air bubbles from glass in 0.5 seconds. Normally this process takes about a week. Energy consumption can be reduced by 60 percent through the use of this technology. This was made possible by on-site technicians making the most of their knowledge. Japan has enormous latent potential as seen in this example. Now the world's human resources, technology and funds are surging towards clean technologies. If we rest idle Japan will lose its superiority in energy efficiency and we will end up bequeathing to the next generation a country that lacks economic competitiveness, or international competitiveness. (3) a "plan to make eco-cars widespread faster than in any other country in the world", under which every other new car will be an eco-car, such as a hybrid car. We took the first step forward with the supplementary budget of fiscal 2009. For example, resources were secured for providing up to 250,000 yen in subsidies when a used car is replaced with a new eco-car, and offering eco-points upon the purchase of energy-saving home appliances. However, in order to achieve this target, there are burdens that the public must be asked to bear. I believe it is irresponsible to the public just to repeat the mantra of "the greater the emissions reductions, the better" without indicating the extent to which the burden will have to be borne in people's daily lives and in industrial activities. For that reason, here I would like to state quite frankly what the public's burden will be. Here is a set of estimates on the public burden. In selecting the mid-term target, we have no choice but to request that the public bear the concomitant burden. Of course, the government must make all possible efforts to reduce this burden, and it is resolved to do so. We must also ask the business community to strive for and bear the burden of further technological development. Nonetheless, this is a cost of protecting our Earth. I truly believe that Japan must tackle the climate change issue with this firm belief. As you can see here, in recent public opinion polls, after becoming aware of these burdens, nearly half the people surveyed supported a reduction of 14% from the 2005 emissions level, a reduction very close to the target I have stated. I should like to express my deep respect for the sound judgement of the public. With unwavering resolve, I will continue to strive for the creation of an effective international framework that leads to a veritable resolution of the climate change issue so that your efforts and cooperation will not come to naught. The ambitious target I have chosen is one that will be impossible to achieve through the efforts of the national government alone, no matter how hard it tries. Ordinary citizens, industry, labour, the national government, and local authorities-we all have to take actions in full cooperation to bring about a low-carbon revolution, including the transformation of our lifestyles and our industrial structures. This is also for the benefit of Japan itself, as it relies almost totally on foreign countries for its supply of most kinds of resources and energy. Last week, I spoke via monitor television to Mr Koichi Wakata, the astronaut who is currently working aboard the space station "Kibou". He said that the Earth sparkles beautifully, shining blue amidst the pitch blackness of space. The Earth, and future generations, now stand at a critical juncture. Those of us alive today have a responsibility to preserve our beautiful Earth for future generations and pass it on to them. Shall we not become "the generation that saved the future" so that children in generations to come can look back on history and say, "That was the era when they achieved the low-carbon revolution and protected the Earth for us"? I ask once more for your understanding and cooperation. QUESTION: On the mid-term target, please explain why, Prime Minister, you decided to take a step further from a 14 percent reduction from the 2005 level which the government had been citing as one of the possible options. Secondly, you noted the need for the understanding and cooperation of the public in order to achieve this target. The public must feel strong unease at the increasing burden [on the household budget], lower competitiveness for Japanese firms and the risk of jobs losses, for instance. Please tell us how you intend to justify this target, persuade the public to accept it, and what kind of support the government will provide in order to win broad understanding. PRIME MINISTER TARO ASO: As I have just said, we must be prepared to take on a certain burden if we are to lead the low-carbon revolution in order to protect the future of our Earth and the global environment and to benefit the future children of Japan. Of course, every effort will be made to limit the burden to be borne by the public. We must also ask the business community to make efforts for [technological] development and to bear the accompanying burden. Even so, measures to address global warming will inevitably lead to higher burdens on the public. In the recent public opinion polls we conducted, nearly half of the respondents indicated their support for this [14 percent] reduction option whilst understanding the burden that this would entail. Japanese industry has a history and tradition of turning challenges into opportunities by taking advantage of its technological prowess. It has a track record of such achievements. I am certain that once again there will be breakthroughs that will lead the world. Our policy has been to avoid targets that have no grounding in the real world, and the decision to increase the mid-term target by one percentage point is consistent with this policy. Please don't think, "It's only one percent." The additional one percent requires an additional 10 trillion yen to achieve. I believe the question now is how to work together to reach this target, and I am saying that we will make the necessary efforts. QUESTION: My question is on how Japan will exercise international leadership on this issue. The G8 Summit and COP15 (United Nations Climate Change Conference) are coming up. Are you confident that Japan will be able to lead the world with this 15 percent target? The most important thing will likely be urging China, India and other emerging countries to participate, but will it be possible to persuade them to do so? In the course of negotiations it may even become necessary to raise Japan's target higher than 15 percent. What is your outlook, and are you confident of Japan's prospects? PRIME MINISTER TARO ASO: Japan's energy efficiency is already number one in the world. We are approximately twice as energy-efficient as the nations of Europe and the United States, eight times as efficient as China, and 8.5 times as efficient as India. The target announced today for Japan is a more ambitious target than those of Europe and the US. Our goal is to lead the world in the low-carbon revolution. Towards this end, we have set the highest reduction target in the world. In comparison with 2005 emissions, the US goal -- more accurately speaking, the stated goal of the Obama administration -- is to reduce emissions by 14 percent. The European Union's reduction goal is equivalent to a 13 percent reduction from the 2005 level. Japan's target is more ambitious than both of these. What this means is that Japan is ready to make greater efforts to reach its goal than the EU and US are respectively to reach theirs. Furthermore, given our already high energy efficiency, we are displaying the will to shoulder twice the [marginal abatement] cost in achieving further reductions. This is clearly a very high target for Japan, and we intend to achieve it with "clear water (mamizu))" efforts. "Clear water" means that the efforts do not include the purchase of so-called emission credits from other nations. In this sense, this mid-term target will reinforce Japan's position, and I believe that it will enable us to show considerable leadership. As can be seen in the pie chart I showed you earlier, China is already the world's top or second emitter. It will be very significant indeed if China and the United States could be brought to agree to emissions reductions, since their output together account for 40 percent of global emissions, more than the emissions from countries with reduction obligations under the Kyoto Protocol, which add up to less than 30 percent. The question is how to deal with China, such as it is. We will of course need to take part in a variety of negotiations from now on. In any event I believe that if we cannot forge a framework including all major emitters, we will not be able to call COP15, to be held in Copenhagen, a success. A perfect example of what Japan can do with China is to be found at the ironworks of Shoudu Iron and Steel Company in Beijing. Rather than use the traditional method of cooling coke, which is to pour water on it, the facility uses Japanese ["dry quenching"] technology that cools it in nitrogen gas. As a result of this Japan-China collaboration, the company has resolved three problems associated with the water-cooling method: the large quantity of dust it produces, the reduced quality of the coke and its higher contributions to global warming. This approach also allows the use of all the generated heat for power generation, and higher coke quality. This is just one example of what Japan can do. You can ask officials at the Ministry of Economy, Trade and Industry, for instance, for more details, but what it boils down to is that China is making use of Japanese technologies like this to lower its industrial costs. It goes without saying that this also helps to address global warming. You can get a very clear picture of this by going to see such facilities for yourself. Through individual cases like these, we are showing our neighbouring countries how the application Japanese technologies can help them significantly to improve their energy efficiency, just as this has been done in Japan. These efforts can make a tremendous contribution to the improvement of China's energy situation. We need to persuade the Chinese of the benefits of working with Japan by patiently giving concrete examples. Such are the efforts required of us. QUESTION: In announcing the mid-term target today, you used 2005 as the base year, while the Kyoto Protocol uses 1990. Some may argue that using 2005 can make the target figure look bigger in comparative terms. Could you explain why, then, you deliberately chose to use 2005 as the base year? PRIME MINISTER TARO ASO: I believe you'll understand the reasons when you compare the mid-term targets of other countries. Isn't Europe about the only place that still talks about comparisons with 1990 levels? I believe 2005 is the base year used by the US, 2006 is used by Canada and 2000 by Australia. So there is no consensus at all on using 1990. The biggest role a base year plays is as a starting line for countries to make common efforts towards the same goal. As such, rather than arguing which point in the past is more advantageous, I personally feel it's more appropriate to establish a base year that is as close to the present as possible. That's the reason for choosing 2005 as the base year. QUESTION: Prime Minister, I'm sorry to digress quite a little, but if I may, I'd like to ask about the dissolution of and elections for the House of Representatives. There are three months remaining until the current term of Lower House members expires. Meanwhile, you recently extended the current ordinary session of the Diet until 28 July. Do you have any plans to dissolve the Lower House during the current session? Another point. Campaigning for the Tokyo Metropolitan Assembly election will begin on 3 July, with voting and counting of ballots to be held on 12 July. Are you leaving yourself the option of dissolving the Lower House and calling a general election during this campaign period? Would you please address these two points? PRIME MINISTER TARO ASO: I've answered this question on repeated occasions in the past, and I'm afraid I can only tell you what I've already said. With regard to dissolution, I am currently considering a number of factors, and I will be the one to take the final decision. That decision will include the presence or absence of a link with the Tokyo Metropolitan Assembly election. QUESTION: I'd like to return to climate change. PRIME MINISTER TARO ASO: Thank you. This is a press conference on climate change, after all. QUESTION: In the current situation, it seems difficult even to achieve the Kyoto Protocol target. Could you tell us in a little more detail about the concrete way in which you foresee achieving the goal of minus 15 percent from the 2005 level? 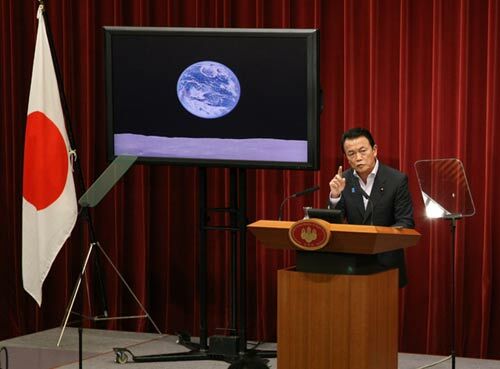 PRIME MINISTER TARO ASO: As for reductions required under the Kyoto Protocol, the major reason why we have so far had difficulty in achieving them is because an earthquake occurred. As you know, nuclear power generation is quite different from thermal power so far as CO2 emissions are concerned. The suspension of a nuclear power plant, the Kashiwazaki-Kariwa Nuclear Power Station of Tokyo Electric Power Company, has been the biggest cause of the deviation in figures [between the foreseen and actual emissions levels] We must offset these differences. Industry, the power sector in particular, is doing its utmost towards this end, by considering various means such as the purchase of credits from overseas including those of carbon sinks. Earlier I also referred to solar power generation. We were saying solar power generation would be increased tenfold when we were discussing a mid-term target of minus 14 percent. In the supplementary budget of 2009 and so forth, we have incorporated the aim of increasing this to twenty times the current level. The additional increase from ten to twenty times compared to current levels will contribute to an emissions reduction of about 0.7 percent. This is a rough figure. In addition, hydropower generation is also important. Small-scale hydropower generation does not involve large dams. In Japan there are many rapids, and other rivers with fast currents. So we have geographical conditions which are suited to small-scale hydropower generation. The use of hydropower is the renewal of energy through water and is thus highly significant. A lot is being done on this by the Ministry of Economy, Trade and Industry (METI) and the River Bureau of the Ministry of Land, Infrastructure, Transport and Tourism (MLIT). And there are even smaller ways to reduce emissions. We hope the accumulation of such small efforts, of reductions of 0.1 or 0.05 percent, will enable us to ultimately achieve the target of minus 14 plus 1 percent [15 percent from the 2005 level]. I am having METI do various kinds of work on this under Mr [Toshihiro] Nikai [METI Minister]. On details please make inquiries to METI or MLIT, and on the entire picture the Ministry of the Environment (MOE) may have the most accurate information.